Stoneware, etched and relief, 0.5L, pewter lid. Created as the coat-of-arms or archival seal of Munich in 1239, the centrally depicted Münchner Kindl (Munich Child) has evolved from a hooded monk standing in front of Munich’s gate to a charming child and symbol of the city. 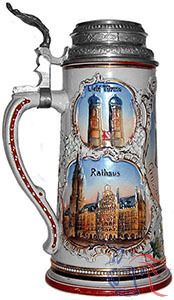 Side images depict several well-known Munich tourist attractions.